It gives me immense pleasure in presenting to the world of scholars this edition 'of the Atmavidyavilasa - A Spiritual Autobiography - of 'Sri Sadasiva Brahmendra Sarasvati with Introduction, English translation and Notes. The text consists of two parts and it was published at the Sri Vani Vilas Press, Srirangam 'on the basis of manuscripts available at the Sarasvati Mahal Library, Thanjavur. I offer my most reverential -salutations at the adorable feet of the Jagadgurus of Sri Kanci Kamakotipitha. I am a grateful recipient of their benign and illimitable blessings which I shall treasure up in my heart for ever. To my revered Guru, Dr. N. Veezhinathan, Former Professor and Head, Department of Sanskrit, University of Madras, I am extremely grateful lor his invaluable advice and help in the preparation of this work. I pursued the Sastri course in Sanskrit -during 1988-1993 at the Sri Candrasekharendra Sarasvati Nyayasastra Mahavidyalaya at Kancipuram under Professors Vishnu Potti, Narayan Jee Jha, and G. Srinivasu. They initiated me into Sanskrit Language and to them I owe my knowledge of Sanskrit. I offer my sincere thanks to Sri J. Gurumurthy, President, to Sri R. Chandrasekaran, Secretary and to other office-bearers of the Adi Sankara Advaita Research Centre for sponsoring the publication of this work under the auspices of the Centre. I am thankful to Sri M.S. Maniyavan of Elango Achukoodam, Chennai for his kind co-operation and neat execution of this work. Sadasiva-Brahmendra-Sarasvati, a Mahayogin and a Jivanmukta became a legend in his own lifetime. He was the disciple of Paramasivendra-Sarasvati, the fifty-seventh head of the Kanci Kamakoti- Pitha of Adi Sankara. He was a prolific writer. He made a verse compendium of the Siddhanta-lesa-sangraha of Appayya Diksita; it is entitled Siddhantakalpvalli with the auto-commentary, Kesaravalli. His valuble gloss on the Vedanta-sutra-bhasya of Sankara known as Brahma-tattva-prakasika and his splendid scholium on the Yoga-sutra entitled Yoga-Sudhakara serve as refreshers to serious students engaged in manana. Experiencing all throughout his life the non-dual bliss, his true nature, Sadasiva enshrines the quintessential experience of the jivanmukti in his work, Atmavidyavilasa which consists of two parts; and, it was published at the Sri Vani Vilas Press, Srirangam on the basis of manuscripts available at the Sarasvati Mahal Library, Thanjavur. 4. This stage is marked by the rise of the direct knowledge of the true nature of the jiva as the Self - the direct knowledge which is variously termed" brahmatmai- katvavidya", brahmajnana, or atma-jnana. The aspirant who has attained this stage is known as brahma-vit. The avarna-phase (avarana-sakti) of avidya would be removed in his case. Hence the Self which is his true nature would never be concealed from him. He will always be aware of his identity with the Self. The viksepa-phase of avidya (viksepa-sakti) will continue to operate in his case till his fructified merits and demerits (prarabda-karma) which have given rise to the body by being present in which he has attained the knowledge of his true nature are exhausted by giving forth their fruits. This phase of avidya would present the world of duality; but the one who has realized his true nature as the Self would perceive it as non-real and he would never lose sight of his identity with the Self. Such a one who has attained the knowledge of his true nature as the Self and who is living out only his prarabdha-karma is called a jivan-mukta and the state in which he is positioned is known as jivan-mukti. 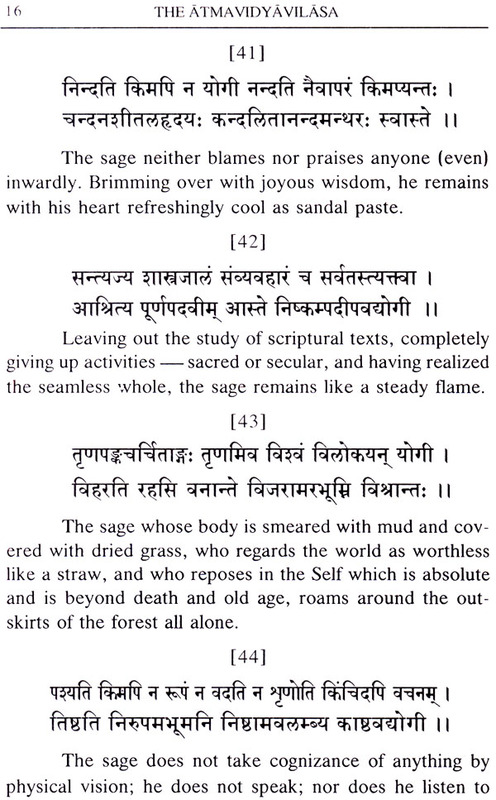 The life of a jivan-mukta has two phases: it is either samadhi 'or mystic trance when he is one with the Self; or, the state known as vyutthana or reversion to empirical life when he wakes back to variety. The world of duality would appear to him when he is not in the state of samadhi. On reversion to empirical life, he would perceive it as superimposed on and so manifested by the Self, his nature which is supra-relational. He has transcended the obligation to perform any karma prescribed in the Vedas. Happiness, misery, etc., pertain to the mind from which he is dissociated; and, so he remains as a mere witness of them.